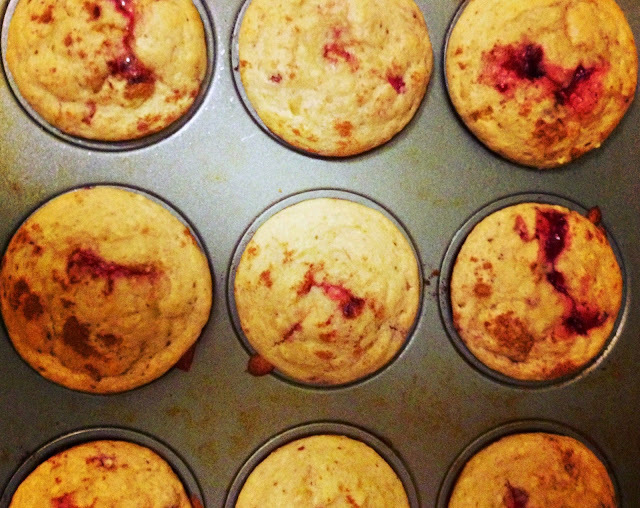 Behold: the Lingonberry muffin. What's better than lingonberries and Fridays?! Fridays with lingonberry muffins! I'll be honest, these muffins are actually from two weeks ago. But they are too Swedish not to share, even though I technically didn't eat them for fika this week. I used Betty Crocker's recipe for "Make it Mine Muffins" and used half a jar of lingon for my "add-in". I also added an extra lingon dollop on each muffin once they were in the tin, then gave them a little swirl. Pretty tasty little suckers. Favorite part: Making the muffins and waiting to see if they would work...and they did - success! Ok, I may have missed the Fika Friday post for last week...oops. But here is a photo of my favorite of fika the weekend. 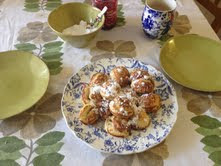 Yesterday, Ryan and I had a little post-breakfast fika of aeblskivers with lingon. So. Good. I hardly ever make aebleskivers outside of the holiday season, so it was a nice weekend treat to cook up these little guys. So that's about all that's happening here. Work. Play. Fika. We're living the good life. Well folks, Ryan and I celebrated two years of marriage last week! I can't believe how quickly this past year flew by. Wow. Here's to year three - woo! To celebrate, we ventured off to a small, old mining town called Julian here in California. They are famous for apple pie. And it definitely did not disappoint. We had this pie two days in a row it was so good. And they served it with cinnamon ice cream...oh my goodness, it does not get better than that!! The town of Julian was booked, so we ended up staying nearby in Borrego Springs, in the desert. There were a ton of huge sculptures throughout which was awesome. Ryan chilling with the desert monster. It was such a great trip all around. We went antiquing, wine tasting, shopping, fika-ing, and more! We drove back a different way so we could check out a few microbreweries Ryan and been wanting to see and they were awesome! We went to the Lost Abbey and Belching Beaver (what a name!) near Escondito. I'd definitely recommend them if you're in the area. Along with Julian being one of the best little towns there are, they had tons of fresh produce for dirt cheap! I bought a bag of 30 avacados for $5. Five dollars people. That's a steal! We also bought a huge bag of serrano peppers for Ryan since he loves all things super duper spicy. Tonight I made them into pickled serrano peppers. Two jars I chopped and two I kept semi-whole. Hopefully they're tasty...I'll never know because they're too spicy for me! Wash peppers well. Either pierce multiple times with a knife, or cut up peppers and place in jars. Boil all other ingredients in the vinegar/water combo. Remove from heat and pour into prepared jars. Let sit in fridge for one week before eating. That's all folks! Hope your week is going well. Tomorrow is Thursday...which means Friday is almost here! It's a glorious day. Friday. 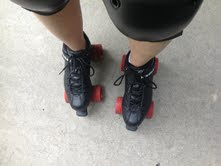 One of the best days of the week. I hope you all had a splendid week! This weekend really snuck up on me! The beginning of the week was crawling by, then all of a sudden, boom! Friday. I'm quite excited about this weekend. Tonight, I get to go see a Prairie Home Companion at the Greek Theater here in LA (compliments of my super sweet and awesome friend, Hannah - thank you!!). Then tomorrow is a friend's wedding! I love weddings. Needless to say, it's going to be a great weekend! In case you didn't know, I adore rhubarb. I just love the tartness of it. And the infamous strawberry-rhubarb combo never disappoints. I stayed up until 11:00 PM on Wednesday to make this pie. But it was so worth it. I love me some pie. It made for some great fika snacks yesterday and today. Best part: the rhubarb, and Ryan's company, of course. What did you do for fika this week?